Still could benefit from filtering though if you are going to use it to blend maps. Has any progress been made here? I have that rear 02 wire dangling and it looks like there is enough mental capacity here to make something happen! I think the person closest (at least publicly) to doing this is Justin (jmont23 above), though he and the tuner he is working with are going about it slightly differently than this thread was pursuing. 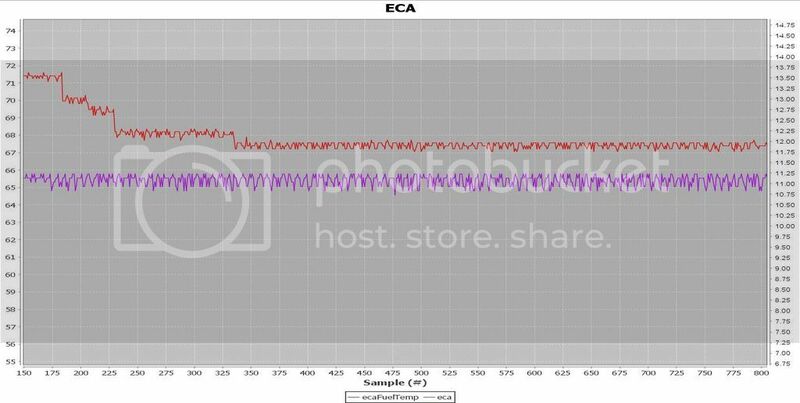 I was (I haven't had much time to pursue any car related for the past while) looking to use the PWM signal directly from the ethanol sensor to hook into the EGT input on the ECU. jmont23 instead purchased the Zeitronix ethanol gauge, which has a 0-5v output, which he is using in the O2 input (rather than the EGT). I'm still interested in pursuing this when I get some time, though no progress on my end yet. Question about the sensors: GM has three types (13577394, 13577379, 13577429), the newest being the smallish one, and then there is the VW version mentioned earlier in the thread (06K907811). I read contradictory information about the characteristics, specifically for the temperature, the bottom temperature threshold for 1ms is always -40*C, but the upper threshold for 5ms pulse is sometimes said to be 125*C, sometimes 150*C, and all this without any specific sensor number reference attached to any of the claims. There is also the mentioning of the 180Hz+ signal to indicate contaminated fuel, but again, no idea if it applies to all sensors. Any info on this would be appreciated. Another thing - most (all?) of these sensors seem to have 3/8" quick connect pipe. What I'd really need is 5/16", any idea if any of them would have it? The VW one? KFATMKRH - EGT model, not sure if necessary, but EGTs do drop, might be good to tell the ECU about it. What else should be on this list? I am planning on having boost maps (MDMAXNMOT / MDMAXNMOB) E85 specific, but I am not after power yet, I am more thinking about seamless and reliable E85 running. I think FKKVS might be worth switching as well. I know my E85 FKKVS is different from my pump fuel FKKVS. Maybe LDRXN so boost level can also be flexed. Of course the already mentioned KRKTE and ignition timing. How much different? I can make a switchable map for FKKVS, no problem, but what worries me is that would not be able to just plug and play E85 the way I want to, even without raising boost / performance, without proper dyno time tuning. So far I have KRKTE map dependant on E85 content and fuel temperature, but it seems the temperature factor should be negligible. Also, even if I make an FKKVS map for E85, does it blend linearly with the gasoline one you think? EDIT: But I guess you also changed the injectors in the process? LDRXN is the MDMAX pair of maps on my ECU I mentioned above, I have been just working with these today. Because there is also an overboost version (switchable by either pedal position threshold or pedal use dynamics, all this time filtered), this makes E85 / gasoline switching a bit horrible. Plus I am implementing a power button for this, it is slightly getting out of hand in terms of map / code complication. 1. Temperature is irrelevant, forget it. 2. FKKVS does not need to be switched. The injector characteristics do not change - if fkkvs needs different corrections at a given pulsewidth, it is likely KFKHFM is baked into it, thus giving issues. Can be switched for ease of use, but should not need to be switched, just extended for the higher pw's reached. 3. ZWOPT does NOT need to be switched, this is totally the wrong way to go and shows comoplete lack of understanding of torque model. Of course spark efficiency goes up and torque goes up, this is normal. 4. Ignition needs to be blended based on a constant that is gathered from a 1D characteristic line, this is because you can most likely already run MBT at E40-E50, so the E85 map needs to be 100% blended in already at that point. Same constant for boost. 5. EGT model is irrelevant, EGT will already be lower on E85 due to advanced ignition and you do not need BTS either because EGT's on E85 are very low. 6. ZWST etc is useless. is there right now a sensor available that outputs 0-5V from stock? No, you need a converter. Can be made a LOT cheaper than for example the Zeitronix, simply by using an Arduino UNO and https://www.adafruit.com/product/935. 5. But that all depends how one decides to tune AFR, doesn't it? I am not saying that AFR tuning through BTS is the proper way to go, but it's good to have the possibility. 4. That I did so far with an intermediate solution, two E content thresholds that border the use of ZW1 and ZW2, so effectively your propsed 1d map has two cells. Sufficient you think? 2. Good, I was hoping it would be the case. 1. Yes, calculating this based on some scientific data from the Internet says so, but the map is in place, I'll just leave it flat temperature wise. And 3. Don't be concerned with my understating of the torque model, it is where it is supposed to be. At first I wanted to believe I don't need switched ZWOPT, and then I read up a discussion about this in another thread. One thing is for sure, shifting ZWOPT simultaneously with ZW is wrong, but I gave up on this idea a day or two after I made the first implementation. If vvt systems need two ZWOPTs then E85 need them too due to different burning rate of the fuel. Moreover, the stock calibration of my ECU has ZW very close to ZWOPT in many areas, in fact past ZWOPT by some fractions of a degree in some spots. Surely having ZW heavily past ZWOPT in large areas is conceptually wrong (as much as it can be practically ok).